EDDIE HEARN: When I saw Luis Arias fight on the Kovalev-Ward undercard, I thought ‘This is a guy that really excited me.’ He had plenty of charisma and he loves to fight and he could become a star on November 11. In the other corner a very determined Daniel Jacobs, trying to recapture the title and trying to pick up more championship belts and potentially unify the division. He’s a honest a kid if I ever saw one and since the press conference in New York Danny Jacobs has been extremely motivated. I believe that his team and certainly I and Roc Nation know all about the threat of Luis Arias and I think this is a great fight. LUIS ARIAS: Training camp is going great. I am working hard. We know what kind of fight we have ahead of us. I plan on making it a dog fight and I am in dog shape and everything is coming together perfectly, my weight is good – training camp has been perfect. I’m ready. What can I say? I am ready. How much have you studied Jacobs? LUIS ARIAS: I have studied him a lot and I have known Danny Jacobs since I was about 15 years old – his name has been in my weight division and I always new that Daniel Jacobs and I would end up fighting at some point in my life. It wasn’t in the amateurs and it ended up being in the pros. I know a lot about Daniel Jacobs. I know how he fights. I mean, I am just going to fight my fight. I can’t change anything up.. I’ve seen everything I could possibly see in the ring. I have been fighting my entire life. I’ve fought them all and seen it all, so I’ve got to go in there and do my thing. I don’t want to run and I don’t want to chase him but I know I’m going to have to so I just plan on making this a dig fight. Daniel Jacobs is going to be in a very dogfight – a hard fight. I’m coming to fight, I’m going to rough him up and I’m going to be in his face all night. I’m looking forward to showing the world what I’ve got. Do you think Danny Jacobs is overrated? LUIS ARIAS: I do think he’s overrated. I just like Danny Jacobs has a lot of things in his story but I’m a lot better. He comes from a big city – he comes from New York – and the amount of media and attention that anyone gets compared to anyone else around the United States is different. But if you go and look at his record there is nobody there that he beat. Eddie mentioned adding another world title but he never was a world champion. Everybody knows that the WBA has two world champions and that’s not even right. There should only be one world champion. Then he had the opportunity to be a world champion and he didn’t win. He has shown there are flaws in his game. He has been down some; he’s been hurt plenty and I don’t see a lot of tough fights. The tough fights that I see – he lost. But he is a good athlete, he is a good fighter and he has good fundamentals. But me personally I think he’s a little overrated and I feel he hasn’t completely cemented his name in the game yet. Like I said, he hasn’t been a legitimate world champion. The Last couple years, GGG has had all the belts. And Saunders . . . He’s just holding onto that belt. But he’s a good fighter and he’s got a lot of experience. This is a mixture of me being underrated and him being overrated. LUIS ARIAS: Jacobs? Well, every time that bell has rung and I’ve been inside that ring and the fight ended, my had was raised. So, no flaws have been shown in my game. How have you grown over the past few fights? LUIS ARIAS: I’ve grown a lot. I’ve grown a lot as a person and as a man. I was in a different stage of my life when I was with that whole (Mayweather Promotions) situation. Now I’m a lot older and a lot wiser and I’ve dealt with my ups and down with the game. I have a daughter now and I’m just in a better place in my life. I learned about the game. I learned about myself. I learned about the people around me. It’s a valuable lesson I had to learn and I took what I need and progressed.. I’ve gotten better, I’m fighting twelve-rounds now. I’ve grown as an athlete and as a fighter and it’s good and it’s a good learning experience. Have you put a chip on your should moving forward since then? LUIS ARIAS: No, people split in business all the time – aside from the boxing game – just business I general. Guys are making millions and doing business deals one moment, the next moment they are doing something else. I wasn’t mad a actually being let go, I was just upset abou the way it was handled. I felt I was undefeated and I should have more respect in the way it was handled and had it been handled in a more professional manner it would have been fine. It is what it is and what motivates me most is to be a world champion. I always felt that it really doesn’t matter what that banner says on top of the ring it’s about what you do in the ring. As long as I am controlling what I can control, which is the fights, I really can’t pay too much mind to that. What happened happened, and it was just a learning experience from God. God obviously had a different plan for me. Were you planning a fight with Jacobs? LUIS ARIAS: No – actually it’s no secret how the game is – whether you are on this side or that side. For the most part everybody in the middleweight division was on this side and Daniel Jacobs was really the only one that was on that side. I was shocked actually because we had put together a list and HBO put together a list of possible opponents and I never heard his name. His name had not come up because he was on that side. But it is what it is and it ended up falling in my lap and I didn’t hesitate to take it. What kind of a fight are you expecting? LUIS ARIAS: Hopefully he does try to come in and blast me out – that’s what I want him to do but I think he’s a little bit smarter than that. We both have a lot of fighting experience – he is just a little more known that me. I feel like the fight will be tactical in the beginning until I catch him. The moment I catch him that’s when the fight will change. I want a war. I want to duke it out. I want to stand in the middle of that ring and duke it out. Tha’ts what I want but I’m sure that’s what Danny doesn’t want. We’ll see how it plays out but I want a dog fight. I want to get out of that ring and feel like I’ve been in a fight – not in a marathon, so. Have you fought anyone like a Danny Jacobs? LUIS ARIAS: I have fought my whole life so in the amateurs I have fought guys like Daniel Jacobs. Even in the pros, I fought a couple bigger guys. My first fifteen fights were at super middleweight which is the reason I’m not worried abut the size difference. I was fighting at the wrong weight class until just this year. I can’t really say. Every fighter is different – they’ve got their own different things. I’ve got a lot of fights – 160 amateurs and twenty fights in as a pro and not even counting the guys I have sparred – thousands and thousands of sparring partners. I’ve seen it all. I didn’t just turn pro a couple years ago. I’ve been fighting my whole life. If you get the win are you hoping to jump right in with the Canelo’s and the Golovkin’s? LUIS ARIAS: The main reason I took the fight was I was told this would be a world title eliminator – that’s what really jumped on me – so I can jump right in. My goal is to become a world champion. There are different ways to get to a world title fight. You can be blessed and just given a world title fight or you can fight the names and climb the rankings. This is one of those fights where I get a name and climb the rankings. I am No. 6 in the IBF and Jacobs is No. 5 in the IBF because he is a name. After this I should be in line for a world title fight – if not the very next one, then the one after that. The goal is to get the GGG or Canelo fight. Whoever has the belts. I want a crack at the world title some time next year. How important is the fight for Matchroom Boxing USA’s first promotion? EDDIE HEARN: Maybe I’m a little bit different, maybe I’m too much of a fan – it the upset comes, the upset comes. It’s boxing and may the best man win. Of course Danny Jacobs is our guy and I want him to win but if Luis Arias goes out there and gets the victory – good on him. It’s about putting on good fights and the way Luis is talking he’s making me want these two weeks to hurry up because I really want to see this fight and actually the good news for the fans is we haven’t got a showcase fight here we don’t have HBO saying welcome to the world Danny Jacobs – you’ve got a real fight. Don’t forget, we threw out a bunch of opponents and he never said ‘no’ to anybody. When Luis Arias got the call he took it straight away. This is a huge opportunity, especially with Luis Arias – when you talk about a world title eliminator – there are official world title eliminators and there is commercial world title eliminators – this may end up being both but it is certainly a commercial world title eliminator and what I mean by that is if he beats Danny Jacobs on HBO he becomes a star overnight. The real pressure on this fight is on Danny Jacobs but Luis will put his own pressure on himself. It’s not a case of “if Danny lost our world would end” but we want Danny Jacobs to win but if Luis Arias deserves the victory – good on him. That’s my philosophy on the fight – I just want to see a great fight. Was there any concern on your end when looking at opponents? EDDIE HEARN: No, we’ve got a reputation for putting on great fights in the UK so the last thing I wanted to do was to come to America and put on a one-sided fight. I gave Danny and Keith Connolly a bunch of names and Luis Arias is one they came back with straight away and said “yea we think that is a good fight” and I spoke to Roc Nation and they spoke to Luis Arias they jumped to the opportunity and it’s refreshing in a sport where you’ve got guys trying to pad their record. This is a risky fight for Luis Arias, he is an undefeated fighter with a good record and he’s challenging Jacobs to beat him to see where he’s at – to see if he’s good enough or if he’s ready. For Danny Jacobs this is a dangerous fight because Danny Jacobs is a good name to give Golovkin or Canelo a big fight, but he knows he has to build himself on the network and he has to be in real fights, he wants to be active and Luis Arias is the guy in front of him. Again, the pressure is on Danny Jacobs in this fight. I think Luis, by the sound of things he is going to go out there and have fun and try and switch his career up. What made you say, about Danny Jacobs, we have to get this guy? EDDIE HEARN: I met him in New York at the Broner-Garcia fight and he looked the part. I knew he could fight in the Golovkin fight, he just about won. So straight away I knew he was a great middleweight but you look at him and you look at his backstory, his profile is not where it should be. There are many guys in American that aren’t household names that should be household names, who have the personality, who have the charisma – I’m not just saying that because Luis is on the line – but if Luis Arias beats Danny Jacobs he will be one of those as well. Deontay Wilder – he is another guy – he could walk down many streets in many cities all over America and I doubt he would get recognized. He is the heavyweight champion of the world, in America. And you look at someone like Daniel Jacobs, he has everything, and he should be a superstar too. He’s not yet but now he’s going to be active. He’s going to get the profile, but he has to win. Without the win he is completely irrelevant. Luis Arias comes to the press conference wearing the Gucci suit, he’s got the chat, he’s got the bling, but if he doesn’t win, he is irrelevant. But if you’ve got the charisma, you’ve got the personality and you can fight and you can win – you’re the package. This really is a crunch clash for both because it takes Luis to another level. Is it extra motivation to come in a upset all of the plans he has for Daniel Jacobs? LUIS ARIAS: To an extent, yes. Eddie just has to do his part. Eddie made a great fight and the people love it. He’ll be happy he just want to put on a great main event. I think everyone was shocked how I took this fight and talking at the press conference. That makes for a better bigger fight. They’ve got their plans and I’ve got my plans but I want that world title. How do you view the pressure that is on Jacobs? LUIS ARIAS: To be hones, all the pressure is on Jacobs. There is no pressure on me. No one really knows who I am. I am the young kid from Wisconsin that nobody knows. To the world, everyone thinks I am coming in to lose. Everyone is expecting me to lose so all the pressure is on him because even if he looks bad or he is in a dogfight and he gets put down again, that’s going to look bad on him. I just have to come in there and put on a valiant effort – I’m coming in to win the fight but everyone else thinks I am coming in to lose. Really all the pressure is on him. How much does it help you with all the pressure being on him? LUIS ARIAS: Ahhh, it helps me because I’ve just got to come in and do my thing. All t he pressure’s going to be on him so I guess we’ll se when that bell rings. What do you see that other people don’t see that make him overrated? LUIS ARIAS: I just look at his opponents – the guys he beat. To be that high and to have that big of a name, like who has he really beat? The only name that I can see that I can really give him credit for beating is Quillin but even Quillin to me was overrated. What happened to Quillin after that fight? He fought Sergio Mora twice – Sergio Mora was in The Contender. The Contender happened when I was like 8 or 9 years old. How did he get the Sergio Mora fight twice? After that I just down see top notch guys. I haven’t seen him in any dogfights. I’ve seen him in a lot of fights where everything benefitted him. Then again, he had two opportunities to be a world champion where the stage got bright and the lights got big and he dropped the ball. He’s getting credit for simply not getting knocked out by GGG and Eddie Hearn gave him a deal for it, and HBO did to because of Eddie. So you tell me who Danny Jacobs has beat. You think too much was made of the Quillin win? LUIS ARIAS: 100% – who has Quillin beat? Nobody. Quillin is another one with a pampered record. I learned a lot in the game. You can make a fighter look a lot better and build him up and make him look a lot better than he really is. You keep him away from punchers, you keep him away from boxers, you keep him away from legitimate threats and you build him up. Soften him up. To me Peter Quillin had a soft record – out of those 30 guys he beat nobody. He fought Andy Lee to a draw. He fought Jacobs and got knocked out. I don’t think Quillin was all that either. I thought Quillin was weak when I was 3-0 at the time. I just don’t see no big name guys that either of them beat, and like I said the two big fights that they had, they lost. How much better do you feel now fighting at middleweight after fighting at a weight you said you didn’t belong in? LUIS ARIAS: A lot better. I have always been a middleweight and I always said I was a middleweight but for some reason they were always having me fight bigger guys and fighting at the other weight class. But I feel a lot better at middleweight – I’m stronger, fast and I’m usually the bigger guy coming in and all the guys the smaller they are I knock them out. Everybody that made 160 except for one guy has got knocked out. My power is a lot stronger than what my record is – not only have I been fighting tough veterans but they were all bigger than me and even then I was able to stop a lot of them. I feel a lot better. My goal was always to be a middleweight champion first and then move up but they had me fighting at super middleweight first and then when we finally got it right I started looking more and more impressive. Do you feel that those fights at super middleweight will benefit you against Jacobs? LUIS ARIAS: 100% – because a lot of those fights with those bigger guys made me be a dog. I had a lot of dogfights. I was fighting guys at six rounds – I was fighting guys that were coming off ten round fights – experience veteran guys. I was 4, 5 6-0 fighting guys with 30 or 40 fights. I’ve had a lot of tough fights – they have just been in the background – but they helped me learn – they helped me learn my pace and they helped me to go around and helped me to learn to fight in a dogfight, so it’s going to prepare me – everything up to this point has prepared me for November 11 and I am 100% ready. What about Danny Jacobs won you over – was it the Golovkin fight or the whole package?? LUIS ARIAS: Yes, for sure I think the Golovkin fight got everyone’s attention. I think the point Luis made about who he has beaten I think you can say that about most resume’s but the fight against Golovkin, many felt that he won, some thought it was a draw and some thought he lost by a round so you know that he s on that level but he didn’t win and that is the reality of it and he wants to do it. He wants to fight Golovkin again and he wants to fight Canelo. I already knew he could fight but when I looked in and when I spoke to him but again he was speaking to HBO and they were identifying him as the guy, the perfect guy, for their network. Once we knew that we were able to work the pieces and get he deal done. So it is a mixture of charisma, personality and the fact that he is a world class middleweight. DANIEL JACOBS: Training camp is going very well. When it is all said and done it will be an eight-week camp. The mental is there, the physical is there and I am just looking forward to putting it all together on November 11. Did you hear Arias on the call? DANIEL JACOBS: I heard him for a little bit. I was on the last ten minutes. I put my phone on mute. It is kind of hard to listen to him because he is trying to force you guys into believing something that does not exist or really is not there. This guy is talking a good one. To the ones that really don’t know, they will believe it but I will let this guy know what’s really going to happen November 11 and all of that talk – he can talk a good one but at the end of the day it’s about what you do inside the ring. Every fighter that he fought had a losing record. This experience that he’s claiming – that he got from these professional wars? I have no idea what he’s talking about. I fought guys, and what you’re supposed to do with guys that have losing records, is knock every one of them out – that’s how you look impressive. Not go the distance and get split decisions and unanimous decisions and no contests. You’re supposed to get these guys out. How many first-round knockouts do I have? I have about as many first-round knockouts as he has fights, so this is what you do when you fight a so-called bum with no experience – you knock him out. I have no idea what this guy’s talking about, but I understand it, I get it, he’s trying to hype this fight and ultimately hype himself up because he doesn’t believe all the things he is saying. Is it surprising to you that he is talking a lot of smack? DANIEL JACOBS: Not really, you have to realize that this guy is a former TMT guy – he is used to the brash talk. He is used to guys trying to sell fights going over and beyond especially if that’s not him – I get it and I understand it – but I don’t think he even believes what he is saying which is the whole confusing part of it. Yea, you can sell a fight but at least put some truth into it. It’s just lies and it’s weird. He’s a weirdo. Is that a TMT trait? They get around Floyd and they think they’re Floyd? DANIEL JACOBS: Of course, everybody wants to do the shoulder roll – they go to the Floyd Mayweather Gym and they want to come out and be like him and that’s exactly how he fights. All those guys are an imitation of Floyd Mayweather. Maybe one or two or three of them are maybe no like that – like Gervonta Davis is his own person and a couple other guys have their own style – Badou Jack – but the rest of them, especially guys who hang around the gym and are just there, it’s the trend that goes around. It’s not bad, of course if you want to try and be like one of the greatest fighters than that’s cool but be yourself – that’s really what it comes down to. I’m a man, I’m not going to try and be like another man or act like another dude – that’s just weird to me, so yea. This is your first fight with Matchroom USA – is there extra motivation, to go for a knockout? DANIEL JACOBS: I’m hoping I would get it but I would be completely find getting a decision, because I’m a boxer puncher and I love to box. I think if I could get twelve rounds in it would be great experience-wise. I want to knock this guy out, but I’m not going to go int here and focus on it. If it happens, it happens. He wants me to stand there and bang with him at every opportunity to fight the fight that we thinks he will have success in but I’m too experienced for that. We have a strategic game plan that we that we are going to go in there and try to execute but there is also Plan B and Plan C if that doesn’t work. I have a lot of tricks up my sleeve and excited for everything to come together, but a knockout would be nice but I’ll be content with a decision. One thing he will know come November 11 is the level between him and I and that will be with the skills I possess and the determination I will show inside that ring. Can you tell the difference pre-Algieri and now? DANIEL JACOBS: Absolutely, it gives you more experience having a team that knows exactly what they’re doing with their knowledge and experience – these guys have been doing it for a long time – Chris, Anthony Irons, Andre Rozier and even the support I get from friends and family. It just helps me but I’ve been at this stage before and I get hat he’s saying that I may have “dropped the ball” – but people are not praising me for making 12-rounds with Gennady Golovkin – let’s not get that confused. If they are praising me they are praising me for the fact that they believe that I won the fight – not that I just went twelve rounds with Gennady Golovkin. It’s like 60/40, 50/50, 70/30 – a lot of people agree that I won the fight and I don’t stand alone with that so I am not getting praise for going the distance with Gennady Golovkin. People realize the talent that I have and that’s just it. My job is to continue what I’ve been doing – I’m a professional and have to act accordingly and the goal is to get the job done and look impressive, so as long as I look impressive which I have done in every one of my fights – let’s make that clear – in every one of my fights I have looked impressive and I always gave 100%. Even if I lost the fight, I was always willing to give 100% and I think that’s what people admire – he just sounds a little sulky to me, maybe because he has the long way up. A lot of people have success early on in the game and a lot of people don’t, but it’s up to him to try and steel the glory and that’s going to make for a good fight but he can’t me mad at me because I have a great team. Not a good team but a great team, and I’ve always had a good team. I may have had, what he says, the easy road, but no I have worked hard for everything that I have gotten and I am going to continue to do so with all of these opportunities as they present itself. Do you want Canelo or Golovkin more, or doesn’t it matter, or everyone? DANIEL JACOBS: I am a realist and I understand the business of boxing. And I know that even thought these guys aren’t really fearful of me, right now I’m in a lose-lose situation with those guys because I am not technically a champion. I am one of the best in the division and the fans do want all of us, I mean the fans do want me to fight those guys, but they know it’s not worth it to step in there with a guy like me. I’d rather continue to do my job, climb the ladder, get a title eventually and maybe chase these guys, but to fight me right now? I don’t see that happening. These guys are looking at it from a business perspective, not from a true champion want to be dominant of the sport perspective and I understand that so I need to go in there and not get frustrated, let my team do their job and I continue to do mine. If they are out who do you target? DANIEL JACOBS: Anything is possible. I think my team has the say-so in the direction that we want to go in. But as a fighter, every fighter is going to say he is willing to face any and every opponent – it doesn’t matter. Our job is to get in there and fight. It’s really not by job to say who we fight. I know that with the team that we have they will set me up and everything will be perfect, but I will step in the ring with anybody and everybody. What made you pick Eddie Hearn? DANIEL JACOBS: He is the most handsome guy out of all of the promoters. It was a no-brainer. This guy is a clean-cut – I just think it really makes sense. May manager Keith Connolly in my No. 1 guy who has supported me since I was 15 years old. I just wanted to go in that direction. When you think of the success that Anthony Joshua has had over in the UK, I think him coming to America and making the same success it would be that much easier because of the experience that he has. If I can get on the train at the first stop with nobody on it, for the ride, I think I am in a great position. HBO is backing me as well, so I think it’s a dream come true to have the best manager, promoter and network, to have the best team with the potential to make me a superstar that is backing me. 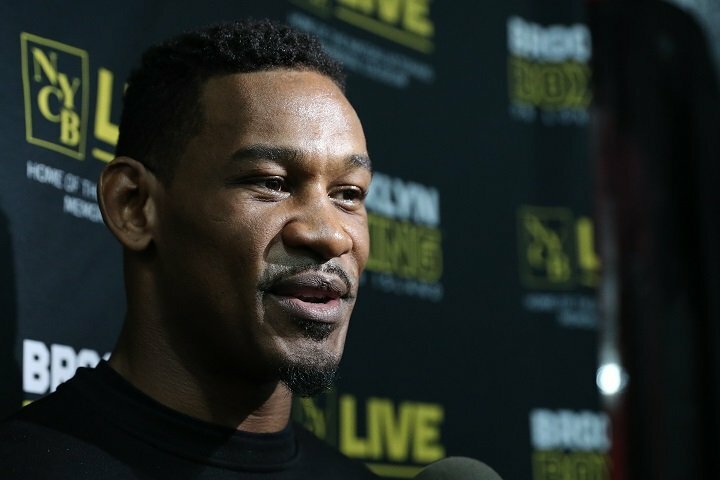 DANIEL JACOBS: I think every fighter deserves that. I think every fighter needs that. Ultimately I think every fighter needs that certainty of a schedule where he can provide for his family and stay active because this is what we do for a living. You have to understand the mental state that a fighter has and that he maybe fights twice every year or year and a half – it can be very frustrating and I think it’s a perfect time for me to start this new chapter and to be a lot more active, and, get the promotion from a promoter that is outstanding. Listen, Eddie Hearn is not saying these things just to say them. If you think about it, and I’m not trying to toot my own horn, but if I was a promoter, if I was a manager, I would want to have a guy like myself because there are too few guys that have the ‘it’ factor in boxing, and I think that I represent the sport well like a gentleman inside and outside the sport and if I can have a guy that I can promote like that, it’s an easy thing to do. I think that with the experience he has it’s a great recipe. Do you think he can do here what he has done in the UK? DANIEL JACOBS: I am looking forward to seeing what great things will happen and I know things will. I don’t know why things are the way they are here but I just know that I’m taking things in my hands and taking control of me and at the end of the day that will benefit me because I put my life on the line each and every time I go inside that ring. It’s a matter of whet makes me feel comfortable and what’s best for me. Do you think Daniel would fight in the UK? EDDIE HEARN: Yes, absolutely, but the focus is on America for sure and what Danny talks about in terms of his schedule in terms of activity, when he leaves the ring on November 11, I’m certain we will know the date of his next fight. So that gives him an opportunity to plan his camp and spend some time with the family and plan out his schedule. We want him to box three times in 2018 and if one is in the UK – no problem. When we look at future opponents of course everyone looks at Danny Jacobs they look a the Golovkin-Canelo winner, but you’ve got Billy Joe fighting Lemieux on December 16 and that’s a fight where Danny is a natural for the winner – it could be in Canada, it could be in the UK, it could be in New York. But really and truly I believe the plan is to grow Danny in America. I don’t think he’s been built up the way he should be. Hey listen, Rome wasn’t built in a day – it’s not just a case of turning up on November 11 like he’s a superstar and he’s being carried out and all this kind of stuff, but in time people will get to see him. HBO will run his story to show the build-up on November 4 – little things like that and activity across social media. It’s going to take time but it’s not difficult when you’ve got a fighter, an asset, a brand like Daniel Jacobs. I don’t want to take the credit for it when it happens but it is quite easy. But again at this tie we are playing catch-up because it should have been done a while ago. But we are doing it now and all he’s got to do is win on November 11 then we move on to the next one. He will really enjoy the profile but he’ll more enjoy the activity and the schedule and know what we are doing. Can you promote a guy in the US like you can in the UK? EDDIE HEARN: I just don’t think there are promotional machines out there. Even when people are sleeping you’ve got to be working whether it’s a viral clip or a digital clip across social media – a different kind of build-up – sometimes you might not even see it. Sometimes things might be happening that you don’t even realize it’s happening but it’s out there and people are hearing the name Daniel Jacobs and seeing the clips and seeing the content, they are watching him fight. It’s not something that happens over two or three months – it happens over probably 12 or 18 months. Fighters in America seem to be promoted over two or three weeks before the fight. They do one press conference and then a bit of build-up before. It’s not about that, it’s about aligning with a brand. If you look a the Anthony Joshua – I am currently standing in the middle of a 80,000 seat stadium and their won’t be one empty seat tomorrow. His partner is Under Armor – commercial brands that actually grow the profile of the fighters. Again you talk about Daniel Jacobs – he is the kind of guy that is perfect for a brand and actually why wouldn’t you want to be involved with Danny Jacobs. Deontay Wilder – he’s another guy. He’s the world heavyweight champion. He looks the part he talks the part, yet where’s the vehicles driving these guys. We deal with 40 or 50 fighters in the UK and some are easier to promote than others. I look at Danny Jacobs and I say this isn’t really difficult. The only thing he needs to do is keep winning. He’ll come out of the ring on November 11, I believe he’ll be victorious and then he’ll have another date in the diary, probably April next year. He can have a little rest with his family, have a nice Christmas and get back to work. It’s not waiting three or four months to find out when you’re next fight is. You have to have a schedule and fans need to know about your schedule because it’s all about the story that you’re trying to tell. What do you think the options are? EDDIE HEARN: I feel like Danny Jacobs is the guy outside of Canelo and Golovkin. I think we need to keep moving forward, but there is not sort of desperate we need him or we need that. We want the Canelo Golovkin winner and that’s the reason why Danny signed with HBO so in the meantime if that fight is going to happen in May, Danny will box in April then we want the winner of that fight. Who we box in April could be the Lemieux-Saunders winner – we would love to have a shot at the world title in April. It could be a whole host of other guys. It’s really a case of building – moving forward getting activity and being ready for the super pay per view fight when it comes. Within 12 months that fight is coming because he is the guy to fight the winner of Canelo-Golovkin and by the time the Canelo-Golovkin fight happens, Danny will be three times the size that he is now so there will be no way out for those guys. Even when they go into that fight they will already know that the winner is fighting Danny Jacobs. So all Danny has to do is just keep winning. That’s all that matters. We take care of the rest. He’s got a great manager in Keith Connolly who is like a father to him. He’s got his back all the time. We plan, we put this structure together for the fights and all he has to do is train and everything else it taken care of. Arias has been disrespectful to you, unlike the way you are to your opponents. How do you fee about that? DANIEL JACOBS: I don’t dislike him. I think like I said before, he’s trying to pump himself up and it’s thru these tactics that he has to do it and I understand it. He is a little younger than me so maybe he is a little immature. The only think that I don’t agree with and it kind of doesn’t sit well with me is the fact that he’s undermining my skills and that’s a big mistake. I get it, sometimes boxers, they have to say certain things to get inside their opponent’s head but I’m too far experienced to let a yungin come in the game and mess it up for me. What do you think about the Saunders-Lemieux fight and what do you think about fighting the winner? DANIEL JACOBS: I think it’s a great opportunity for me. Like I said before I’ll be going against these top guys and I’m gunning for these guys and it would be that much better if they had a title. I think there’s a great possibility for the fight to happen and it makes sense because those guys have been avoiding me for some time now. Now that they are fighting each other, it’s like where else do you go if these guys are contractually tied. Yea we are going to go to Montreal if in fact we get this victory which I am sure we will, we are going to be present and hopefully – it doesn’t matter who wins to me -I think BJ might edge him a little bit it is boxing and anything can happen. But it doesn’t matter I think the winner makes total sense to fight me in the future, the near future.